The last time I was at Baby's All Right, the bar-restaurant-music venue in south Williamsburg, it was packed to the gills for The Clientele's show back in July. This past Sunday found far fewer people there for a show headlined by DJ/rupture and celebrating the release of the debut album by No Lands on New Amsterdam Records. But a smaller audience is to be expected if you skitter along the cutting edge, as Rupture does, not to mention competing for eyes and ears with the VMA's and the Afro-Punk Festival. When my friend and I entered the performance space, Lorna Dune was already on stage, engrossed in her keyboards as people looked on, standing in rows almost exactly one person apart from each other, like trees in a nursery. The last time I encountered Dune was as a member of Victoire, Missy Mazzoli's indie-classical chamber ensemble. She was playing keyboards in that context as well, while also doing some very cool live remixing of Mazzoli's work. Her own music is less challenging yet expertly assembled. Warm layers of fat synth chords and arpeggiated melodies overlap atop pulsing rhythms, shifting and changing. Crescendos are approached but never quite arrive. Lorna Dune's music is not really retro but has strong referents to Krautrock and 90's IDM from artists on the Warp label. In the end, it's a bit static - she was the only one dancing. Right now she might be devoting her more outré impulses to her collaborations, which is fine, but I'll be curious to see what she does next. DJ/rupture had been standing next to me for most of the set, but I couldn't get a word in. As soon they started breaking down Dune's gear, he dashed to the front of the room, stepping behind his impressive set-up at the left of the stage. He launched in without buildup and quickly had people dancing. He was supposed to headline so at first I thought this was a quick mix while No Lands set up their stuff. 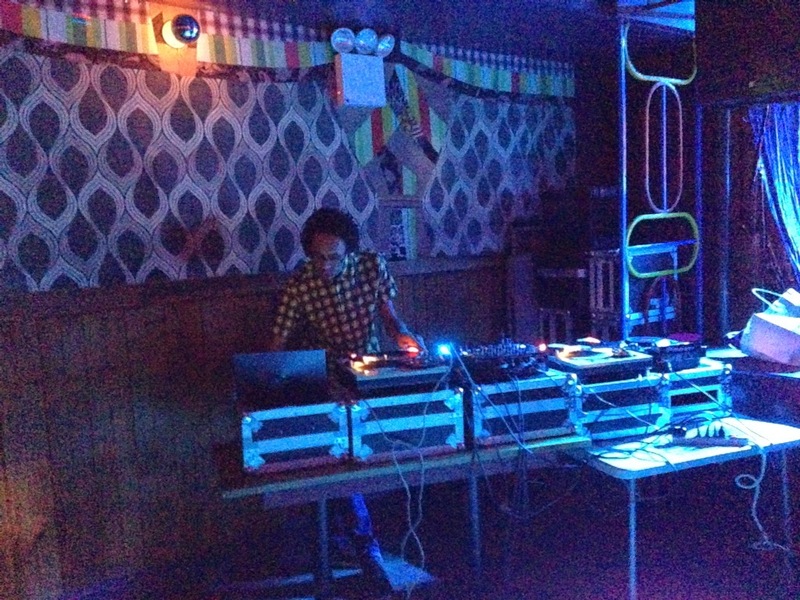 However, a night at Baby's doesn't always go as advertised and I soon realized that this was Rupture's set. Perhaps he had magnanimously offered to let No Lands finish the night. Either way, his work was magnificent, similar to the mesmerizing Mudd Up shows he used to do on WFMU, but somehow both more layered and more seamless. This is the art of the DJ as fine art - but in no way effete. The groove was relentless, spanning electronica, Algerian pop, reggae, hip hop, West African sounds and more. Watching Rupture work was fascinating. His kit consisted of five cases lined up: a laptop, a turntable, a mixing board, another turntable and a CD controller. "Where's the wax cylinder?" joked my friend. Rupture's level of engagement and control of these devices was virtuosic. His left hand would gently pull back on the turntable, finding the perfect spot on the vinyl, while his right hand was busy doing something on the board. A high point for me was when he began dropping fragments of vocals from a Rai song and interleaving it with something that sounded South Asian. It was pure hypnotism as the two streams of sound abutted and began to blend. That assemblage cross-faded into some heavy digital dub, complete with air horn, bringing the tempo down before moving into other areas. After about an hour the deeply involving set was over - just like that. He humbly accepted our applause and walked off. I wasn't sure what to expect from No Lands in the live context. Negative Space came out in July and is essentially a solo project by sound designer and electronic musician Michael Hammond. You might call it a synth-art-almost-pop record, hinting at 80's hit-makers without actually going there. Even with the Linn drums, there's nothing ironic going on in these lush, warmly produced pieces. The album opens with Icefisher, a gorgeous overture in which sweet chords dialogue with perfectly calibrated distortion before blending into the bobbing rhythm of City, the first song proper. Synths chatter and there's a big, melodic chorus, with Hammond's soft tenor mixed down to join the track as another texture. There's a diffuse quality to Hammond's music, as if he listened to the radio through the wall, half-remembered what he heard, and then tried to play it back using different instruments. This makes Negative Space all the more tantalizing as your mind works to resolve the blurred soundscapes. It's no surprise that he lists I Believe In You from Talk Talk's Spirit Of Eden as one of his favorite songs ever. That song is included in the Mixtape he put together for Q2, along with everything from Eno to Grieg and from Feldman to Scott Walker, providing a fascinating glimpse of his influences. Pretender has a pulsing beat and, in the corner of the mix, chiming Simple Minds guitar. On Sleep Atlas, he treats his voice heavily, crafting it into a sound not unlike Jon Hassel's cosmic trumpet. Eyesore broods along, with dramatic guitar flourishes, more Hassel-like vocals, and a chorus that opens up like the sun streaming through clouds. 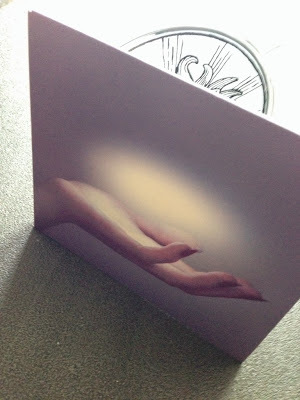 Firebride is half-song, half ambiance, like David Sylvian used to do, and there's even biting guitar and a touch of Popul Vuh's pastoralism - sheer beauty. The album ends with the even more ambient Seawall and the blissful meditation of Outside Of You. Negative Space is a great album, an extremely assured debut, and one which should make some noise on those lists at the end of the year. But here we had a full band taking the stage, with Hammond joined by his brother on guitars, a bassist, and two more members on keyboards and electronic percussion. Their stage presence was appealing and affable if not quite displaying the confidence demonstrated by the album. The diffusion was there, but some of the forward motion was lacking and I could see a listener feeling slightly lost if not already familiar with the songs. But, heck, from what I can tell, this was their ninth show together and it was a great opportunity to observe how the songs were put together. For example, there were a lot more guitars involved than I thought, although they were rarely played straight. Harmony vocals also came into play, with Hammond's brother chiming in on most of the songs. The set was also a chance to shower some acclaim on Hammond for making such a great record, something the audience did without hesitation. After they finished, I checked in with Rupture as he broke down his gear. His Julius Eastman record from last year (released under his given name, Jace Clayton) was his first foray into the classical avant garde and a complete success, so I asked him if there was anything else in the works. Not in the way of recording, he told me, but he will be performing his work Enkutatash on September 11th in Washington, DC, which will feature the Homeland Security threat level system sung by a chorus using the Ethiopian scale and mixed with an East African harvest song. It sounds like it will be very intriguing, connecting the cerebral and the emotional in a powerful way, just like much of the music that filled the room at Baby's All Right on one of the last Sundays of summer. The first flowering of what would come to be known as punk rock encompassed such diverse sounds as the cerebral bubblegum of Talking Heads, the streamlined girl-group pop of Blondie, the artful interlocking explorations of Television, and the sped-up Spector of the Ramones. Soon enough, after a transatlantic crossing or two, punk became codified into a studded-leather jacket and safety-pinned cul de sac of loud fast rules. Did something similar happen in the world of "new music" or the classical avant garde? Did the seismic blasts of The Rite of Spring and Schoenberg's serialism blow things up to a degree that composers can draw on a limited palette of structures and sonic semi-innovations and still get across as "new?" Can you just deploy some additional percussion, amp up the orchestral clangor and dissonance and call it a day? And what do those European referents have to do with the American tradition? That's not to say that all contemporary American composers are beholden to an outdated notion of new-ness. 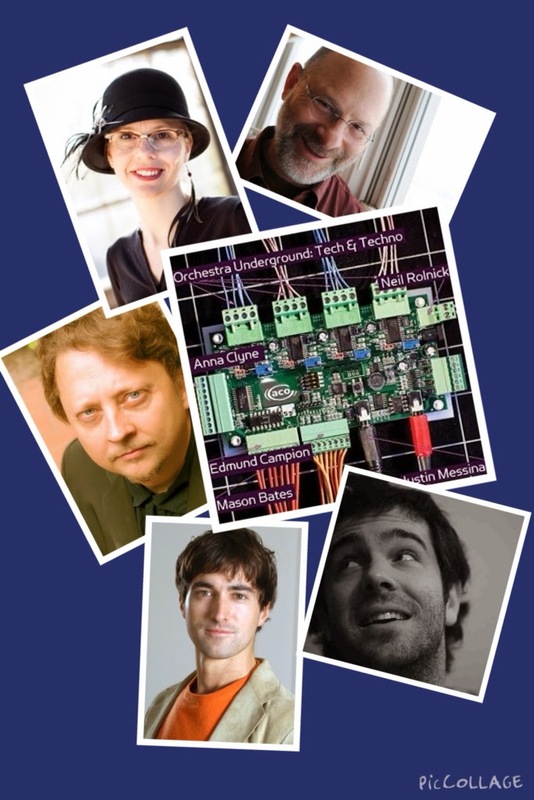 You have artists like Julia Wolfe, Mario Diaz de Leon, Daniel Wohl, Anthony Chung, and even legends like Alvin Lucier who continue to push the envelope of what's heard in the concert hall. It's also not to say that some of what might be called the "retro avant garde" doesn't make for good or even great listening, it's just that it doesn't do it any favors to present it as something earth-shattering. I put these passing thoughts down to give an idea of some of what I was working against when listening to the American Composers Orchestra's new album, Orchestra Underground: Tech & Techno. Right from the start, without even reading the liner notes, I was dealing with the word "techno," which starts a post-Kraftwerk thumping in my ear as I recall the sounds of Detroit dance music from the late 80's and early 90's. Let's clear that up quickly: there is almost nothing on this collection that sounds remotely like Detroit techno. And much of what we do hear strikes those "new music" chords without being hugely innovative. But it's still damned fine listening. Justin Messina's Abandon, which was inspired by the above mentioned Motor City music is instead a pensive slow-build that more readily calls to mind the excellent television music of Bernard Herrmann. Its alternating and interacting motifs, driven by a clanking cowbell, effectively build tension over a concise nine minutes. He expertly uses the full range of orchestral colors, with winds, brass, strings and percussion seeking dominance but finding parity, until the witty ending featuring a ticking high hat and a bass glissando. Prior to this, I was only familiar with Messina via his memorable arrangement of John Cage's In A Landscape for Brooklyn Rider - now I'm even more interested. The album begins with Edmund Campion's Practice, and a quick scan of his bio leaves no doubt that he has completed enough of the titular activity to "get to Carnegie Hall," or at least Zankel Hall, where this was recorded. Also about nine minutes long, Practice starts with a vaguely Spanish fanfare, with muted trumpets, tinkling triangles and skirling flutes, before settling into a calmly relentless forward movement propelled by a slow ostinato from bassoon (I think) and bass. The computers are so seamlessly merged into the orchestra that, to be honest, I didnt really hear them until the end, when a what sounds like a triangle's ting is distended, distorted and eventually flattened into almost white noise. Regardless of how cutting edge it is or isn't, Practice is a brilliantly colorful piece with loads of drama. Tender Hooks by Anna Clyne is next and it kicks off with a very Stravinskian sound, tension and release happening simultaneously, and a very active drum section. Almost following a sonata form, it quietens down to a brooding segment, enhanced by rumblings, ratchet noises and other electronically-produced accents. Lyrical flutes, brass and piano intertwine with more computer-generated sounds until a snare's hard thwack seems about to kick off a climax. Instead the sound opens up wondrously and then gets progressively darker and stranger. For the last minute, Tender Hooks is quiet and searching, bringing this very satisfying piece to a close. The final two pieces are each about twice as long as the first three, starting with Neil Rolnick's cleverly titled iFiddle Concerto, which was also included on X10D, the ACO's last Orchestra Underground album. Todd Reynolds is the soloist, playing the "iFiddle,", which "combines the computer and violin into a single musical instrument," according to the composer. At the start, it almost sounds as if the acoustic and electronic impulses are at odds. They seem to go head to head, with the computerized sounds a fractured reflection of what the violin is doing. The orchestra plays a strong supporting role, providing a bed of rhythm, harmony and, especially from the trumpet, counterpoint. About a third of the way in, we get an amusingly louche and jazzy second section, with Reynolds's line sounding fabulously rich and assured, while also spitting out some wacky electronic shards. There's a pizzicato segment where you can't tell exactly what's acoustic and what's electronic and the last few minutes have a wonderful swagger and a head-nodding rhythm. Some sounds bring to mind the outlandish funk of Jimi Hendrix's wah wah, and the piece ends on a literal high note. The iFiddle Concerto is an entertaining and quick 18 minutes, managing to be both crowd-pleasing and a bit novel. The final work is by Mason Bates, who's definitely on a hot streak this year. Besides this one, other 2014 releases include his four-movement Alternative Energy, on an album of the same name by the Chicago Symphony Orchestra and conducted by Riccardo Muti (Anna Clyne's Night Ferry is also included), as well as a album of his compositions called Stereo Is King. I hope to have the opportunity to explore those more in depth at another time as Bates is definitely on to something. 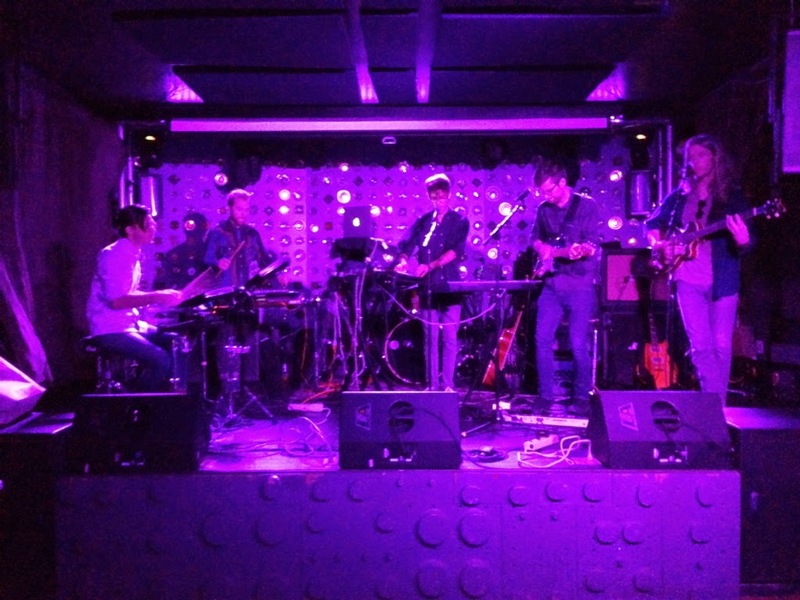 The piece here, Omnivorous Furniture, features a drum pad and computer alongside the orchestra, and was (we are told) "heavily influenced by down-tempo electronic with roots in the British hip hop movement." OK, that must have been fun to write, but I don't really hear anything over which Tinie Tempah or Roots Manuva would be inspired to spit a few bars. What I do hear has an American swagger and energy, an amped up Aaron Copland vibe that struts in on giant steps. The computer and drum pad are not so seamlessly integrated, instead they are delightfully obvious, snickering and clacking across the soundscape and daring the orchestra to keep up. An actual four on the floor rhythm does eventually develop for a while, just before a lushly romantic interlude, all plangent strings and warm brass. The final section features bass drum drops like depth charges amid some angular aggression from acoustics and electronics alike, until it all comes to a thrilling halt. This is good stuff, whatever Bates happened to be listening to while he composed it. In fact, it's all good stuff, and if they had called the album "Reasonably Fresh Sounds from Young-ish American Composers," I would have nothing to complain about. But, I suppose that would be like advertising Volvos as being "boxy but good." Don't let the marketing get in your way - some great listening awaits you. In 1961, sultry entertainer Ann-Margaret recorded I Just Don't Understand, a minor key ballad with a haunting melody that made perfect sense coming from the pen of co-writer Marijohn Wilkin, who also co-wrote the perennial classic Long Black Veil. Producer Chet Atkins gave the song the full treatment, with harmonica, male backing vocals (probably The Jordanaires) and, most outlandishly, a stinging fuzz guitar, apparently only the first or second time such a sound had appeared on a record. The song - and the sound - caught the ear of John Lennon who, according to Mark Lewisohn, just had to sing it. While The Beatles were unable to recreate the fuzz guitar, the song made it into their live set and (after being requested by "Kathleen, Carol and Pauline of Bradford") was recorded at the BBC in 1963. The Beatles version was essentially lost to history until 1994 when the first Live At The BBC collection came out. By then, people new to the recording were able to bring all their knowledge and feelings about Lennon to bear when listening to the song, investing what could simply be a terrific (if slightly kitschy) relic with extra significance. From what we know of Lennon's conflicted feelings about women - the jealousy, the neediness - its easy to see what attracted him to the song. It's also not the first time he took on a track that had originally been sung by a woman, adding to the intrigue. I Just Don't Understand has had some legs, being recorded a few more times in the 60's and 70's, but no one was searching Jerry Reed's version for psychological insights. Now we have it resurrected again by Spoon, the one cover featured on They Want My Soul, their first album in four years. They also avoid any fuzz guitar, letting piano drive the song, but their version is an interesting window into the emotional territory of the album. Unlike John Lennon, we don't know a heck of a lot about Britt Daniel, Spoon's leader, except that he's a rock & roll true believer, probably as much of a fan of the music now as when he began his career in 1991. As pointed out in the recent article in The New York Times Magazine, Daniel often approaches songwriting analytically, bringing disparate elements from things he loves together in new ways, creating endless nesting dolls of references, inside jokes and homages. Despite those magpie tendencies, Spoon has an immediately identifiable sound, often due to the alternating swagger and vulnerability of Daniel's voice, which has grown grittier over the years and is one of the marvels of rock. He pushes that burr beautifully in I Just Don't Understand, and all over They Want My Soul, sounding better than ever, but also more defended. We've come a long way from the late-night thoughts of Everything Hits At Once (Girls Can Tell, 2001): "I go to sleep but think that you're next to me." I used to feel guilty playing that in the office after my colleague had been dumped - it cuts to the bone in a way that Spoon doesn't really do any more. The subtext of the album title is "they want my soul - but they ain't getting it." In truth, this is the direction the band has been going in since Gimme Fiction, their breakout album from 2005, and They Want My Soul is their most bulletproof album yet. That hard, brilliantly textured exterior, perhaps partly due to new production partners Dave Fridmann and Joe Chicarelli, makes for a killer headphone listen, encaging me on the streets of NYC like a Mobb Deep record. Hip hop is not as off-kilter a reference as you might think, as Jim Eno's drums have never been more processed. Let Me Be Mine even has some of the badass Gary Glitter strut of Kanye's Black Skinhead. Inside Out, the second cut, starts with a deep, melancholy groove led by Eno's fat snare, almost outsized in relation to the other instruments. I can almost hear a remix with Chance The Rapper telling a sad story about his grandmother over this beat. Inside Out also features marvelous celestial keyboards which I suspect are from new guy Alex Fischel rather than long-time member Eric Harvey. Fischel came to Spoon from Divine Fits, Daniel's new-wave leaning side project, and his electronic sensibility was one of the delights of their 2012 album. Eno is the other key member of Spoon and his brick-hard snare is the first sound you hear on They Want My Soul, kicking off Rent I Pay, a great mid-tempo slow burner that sets the tone for the album from the jump. With its aphoristic, pissed-off refrain, it's a bit bitter and as such has companions in Do You, Knock Knock Knock, Outlier, the title track, I Just Don't Understand and Let Me Be Mine, making for a slightly malevolent listen. I don't think Daniel wants us to read too much into that, however. As he said in Paste magazine earlier this month: "...if there's a band that's...doing something vaguely threatening, it appeals to me. I like it." It's as if he's playing with moods and emotions, the same way he assembles the layers of the tracks in the studio. And those layers sound fantastic, often pairing artfully scuzzy guitars with the sleek gleam of the rhythm section, like a rusted car riding on a chrome-plated chassis. Many of the songs also have a driving urgency that sets the pulse racing, even if you're not sure what Daniel is singing about exactly. Outlier fades in with a pumping bass line, organ stabs, and dry acoustic strumming, lending a windswept air to whatever atmosphere surrounds you at the moment. It also contains the priceless couplet "And I remember when you walked out of Garden State/You had taste, you had taste." Another classic line comes in the title song: "Educated folk singers want my soul/Jonathon Fisk still he wants my soul/I got nothin I want to say to them." Jonathon Fisk is the name of a song from Kill The Moonlight, Spoon's fourth album, about a kid who bullied Daniel in high school. So you wonder - is Daniel still wounded by Fisk or is he just adding another layer to the glass onion? In the end it doesn't matter. Spoon has one of the best, most consistent catalogs in rock, earning them the right to be self-referential. They've soundtracked my life since 2005, when I Turn My Camera On triggered an investigation into their past and an investment in their future. They were also one of the bands that made me commit wholeheartedly to the magnificent music of our time and to do my best to stay on top of it, inadvertently leading to this blog. For that, they have my soul. Not to worry, Britt - we don't want your soul, just more terrific records like this one, whenever you and your compatriots are so moved to make them. Spoon is on tour in the U.S. and Europe throughout the fall. Catch up with a playlist of some of Spoon's greatest songs. There was a minor Facebook kerfuffle among my circle a few years ago when an old college friend reported that he had seen Fela! on Broadway and the dancing was "better" than when he had seen Fela in concert back in the 80's. This confounded many of us. By what metric could you compare the professionally trained dancers performing top-flight choreography by Bill T. Jones to the moves of the women, many his wives, who danced on stage with the real Fela? This conundrum is at the heart of the divide between music as it arose in Africa, where it was a part of daily life, and as it came to be established in Europe, where it develped into a profession with a rigid structure of training and performance. Although it is only glancingly addressed, the conundrum is also at the center of Finding Fela, a new movie about the Nigerian musical legend directed by Alex Gibney. The film begins with Fela on stage in Berlin in 1978, so magnetic you can't look away, proclaiming "I want you to look at me as something new, that you don't have any knowledge about. Because most - 99.9% - of the information you get about Africa is wrong." After a tantalizing snippet of performance, we get a brief introduction to the shambles (and shame) of post-colonial Nigeria, the violent context from which Fela emerged. Then we cut to the team that created Fela!, working on the show two years before it debuted. This kind of access is to be expected from Gibney, known for politically charged documentaries like Taxi To The Dark Side and We Steal Secrets. From there the movie proceeds to go back and forth between Fela himself, detailing his life and career, and Fela! the show, with both backstage footage and long clips of a performance. Much of what we see on both sides of the story is fascinating. Few musicians in history have lived a life like Fela's, and there is no doubt that Jones and his talented crew were utterly sincere in their quest to bring that life and his music to the Broadway masses. However, that didn't prevent a nagging discomfort I had throughout the film, the feeling of being sold to, as if there was something vaguely promotional about the enterprise. As a reel for investors in Fela!, it's hard to imagine something better than Finding Fela - not that it needed any help, as the show was boosted to Broadway by the deep pockets of Jay-Z and Will Smith. To be fair, that nagging sensation was easily put to the side as I became absorbed in the archival footage, some of it from Music Is The Weapon, a 30 year old documentary based around Fela's bid to become President of Nigeria. We see him in Kalakuta, the compound in which he effectively seceded from Nigeria, educating and employing dead-end young men, and performing at The Shrine, his club. We learn about his middle-class Christian upbringing, and his school days in London, where he got bitten by the jazz bug. By all accounts he was a mediocre trumpeter and a terrible student - "He was a dunce," says his son Femi. When he returned home, he connected with genius drummer Tony Allen, forming a jazz band that was going nowhere fast. For many years, the dominant music in Nigeria was High Life, a Ghanian import and mainly lighthearted sounds for dancing. As it began to fade, there was active competition among musicians to create a successor. Fela hit on a combination of American funk, mainly via James Brown, and Afro-Cuban rhythms along with the dying strands of High Life, to create Afrobeat, which took off like a rocket. It quickly becomes clear that Fela's main talent was as an architect, synthesizer and collaborator. In fact, there was no one thing that he was best at. His voice had a limited range and sometimes wavered around the key. While his tone on the sax was distinctive, his intonation was questionable and his solos often revolved around a few stock phrases. On the organ, he could deploy odd chords and harmonies that never quite settle into the songs. While he was always in the groove, unlike his hero James Brown he was not a great dancer. His mastery was in how he brought everything together, orchestrating the intricate rhythms, conducting the horns, driving on the band with his unstoppable energy and natural charisma. Gibney seems to almost parcel out that charisma, as if to avoid giving too much competition to Saha Ngaujah, who created the role of Fela for the stage. While Ngaujah is undoubtedly terrific, it's hard not to see the artifice when confronted with the real thing. The music is also somewhat parceled out, by necessity as the average Fela song is about 20 minutes long. However, as the ubiquitous Questlove points out, "The more it repeats, the more it affects you," so the question remains what first-timers will ultimately take away from the film. Hopefully, they will investigate further - and with a classic like I.T.T. or Sorrow Tears & Blood, instead of the movie soundtrack, which is a good listen but mostly contains edited versions of his songs. As successful as his early Afrobeat singles were, Fela didn't really hit his peak until he defined himself in opposition to the powers that be following a drug raid on Kalakuta. His first confrontational song (and probably the first in Nigeria) was Alagbon Close, which detailed then harsh conditions in the prison of the same name. From then on, he became more and more outspoken against the corrupt government and military. They didn't take it lying down, responding with a brutal attack on Kalakuta, during which the police burned the place down and savagely threw Fela's mother from a second story window, causing the injuries which claimed her life a year later. Tony Allen is asked if Fela changed after this devastating experience: "No. He became triple or double of whatever he could be before, you know? No, this time, now he's really...mad." Mad as in angry and also a little crazy. Less than a year after the attack, he married 27 women in one ceremony, claiming the desire to live "a meaningful life" in line with Yoruban tradition. Michael Veal, author of Fela: The Life and Times of an African Icon and one of the well-used talking heads in the film, explains that Fela's approach to polygamy was far from traditional. While some of the mechanics (mostly scheduling) of the domestic arrangements are discussed, the film glides by the discontinuity between Fela's attitude toward women and his message of freedom and sovereignty. Complex, contradictory, confounding - Fela was all of these things and more. But the music rarely faltered. When nearly every member of his crack band Africa 70 quit over financial issues, he had Egypt 80 up and running in no time. From his first official album, Open & Close, in 1970, until the last in 1992 he released nearly 45 albums, many of them excellent. Thanks to a couple of comprehensive reissue programs, they're all available (I have nine on my iPod now, including the great posthumous release, Live In Detroit 1986) on CD and LP, not to mention Spotify and Bandcamp, so there is no reason Fela shouldn't be an essential part of your musical life, as he is for me. Since I am already a fan, it's quite possible that I'm not the precise audience for Finding Fela, although it always rewarded my attention and certainly deepened my understanding of the context of his music. 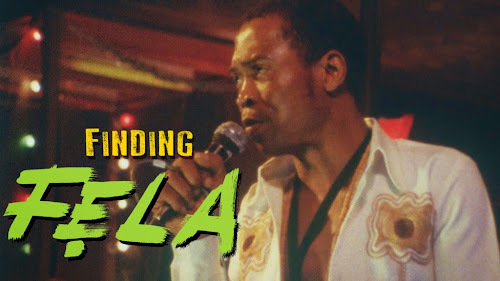 As Bill T. Jones states near the beginning of the movie, his impetus in creating Fela! was to stem the growing tide of ignorance about Fela's life and music in the years following his death from AIDS in 1997. While that's an honorable impulse, and the musical served to inject some Afrobeat back in the culture, there's also the matter of what you give up about an artist as powerful and individual as Fela when you advocate for them via a different medium. The structure of Gibney's movie had me hoping he was going to address that issue, and the contrasts between art and artifice that I brought up above. He comes very close during the end credits, when we see a performance of Colonial Mentality by the Broadway cast, featuring a very special guest: Femi Kuti on saxophone. He's more of a virtuoso on that instrument than his father was and he blows the roof off, in a stunning solo that totally collapses the difference between the imitation of a performance and performance itself. So in the the end Finding Fela may not be as incisive as I hoped, but see it. And don't stop there - keep going until you find the real Fela.